Our 1953 Peugeot Triporteur was brought back from France by our request. 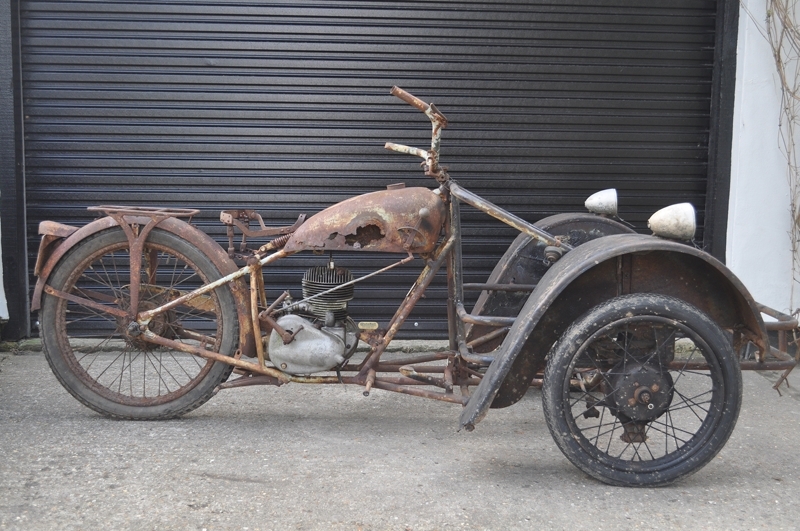 This bike making the oldest bike restored by Lacey’s Motorcycles – “and don’t we know it!” This TN55, three-wheeled reverse trike replicates the P55 Peugeot with its modified front end. This Triporteur TN55 offers the sweeping front mudguards unlike ones you would see on its later model the TN57. This bike really helped get France back to its feet after WWII. With its wide use of the haulage capabilities from its wooden box front – From demonstrating items in retail to delivering food. As always, time was taken to inspect what we have to work with. Taking immediate action to seized bolts, etc... (With the use of two WD-40 cans throughout the bike) Extra time and care was taking in stripping the bike down due to how brittle some things can get over 60 years of neglect. Understanding what difficulties were present if parts were broken or missing. Parts are bagged as the full restoration gets under way. With a restoration from this era, rust is the biggest concern. How we treat it now – will determine on how long the bike will stay fresh, that goes with any restoration. Decisions were made to blast tin-work with glass bead slowly with steady 60 PSI, making sure that no unnecessary holes were made for repair later on. After most of the prep had been achieved inside the cabinet - it was a matter of time before the rust process will begin again. Each item of steel work received 3 coats of Phosphate rust repellent. This ensures we could work with the steel work without it rusting before our eyes. Minor repairs were made; it was time for the finishing. Panels were then acid etched once again before primers and top coat. It wasn't a big surprise that the engine had a top end AND crank seize within. With “At least” 30 years of standing (most likely outside), the engine was all pretty solid. Once apart, parts could then be singled out to be cleaned separately for the best possible results. Taking vows of "slowly but surely" – making sure that no unnecessary damage was made. These were the processes we took in achieving the results you see today. 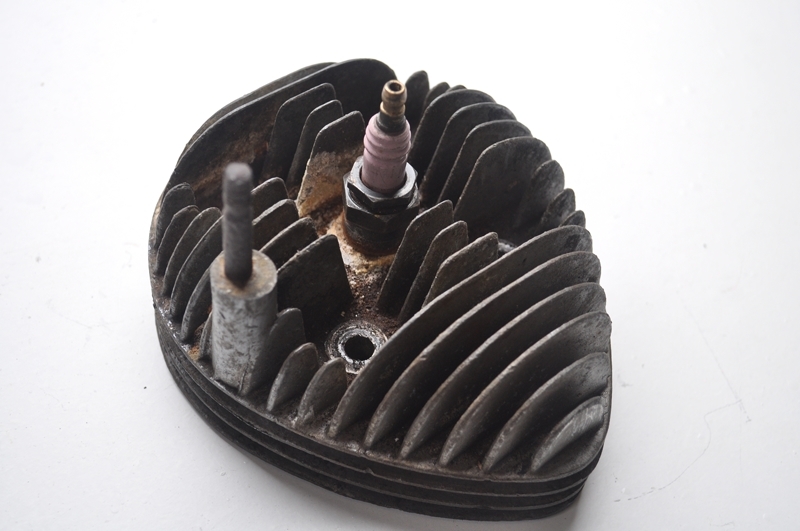 Cylinder head, Barrel and engine cases were cleaned with acid using electrolysis. Parts were checked upon every 2 hours for the first 6 hours to check for signs of etching to the aluminium. Parts were left for a further 48 hours to achieve what you see in [Picture 2]. A remarkable result for such little effort, but a necessary part in the cleaning/degreasing stage before blasting media. Now that all the grease and corrosion is gone, it is safe for glass grit to penetrate through and etch the aluminium to a unison covering. Crushed Glass media was used at constant 70 PSI to achieve the result you see in [Picture 3]. 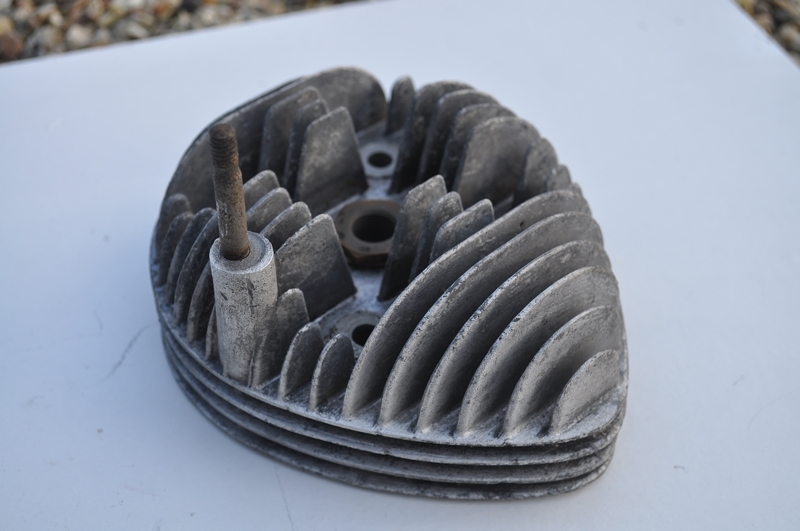 A clean and matt finish cylinder head – with embedded glass. Of course the embedded glass needs to be removed for the engine to run safely. Any final imperfections were sanded down for the final peening stage. The crushed glass was then swapped for fine grade glass bead. Although a tedious process, going through each side of each fin to achieve what you see in [Picture 4]. A perfect satin cylinder head. A new stainless stud was cut for the cooling fan and the underside polished to aid the running in process of the bike. 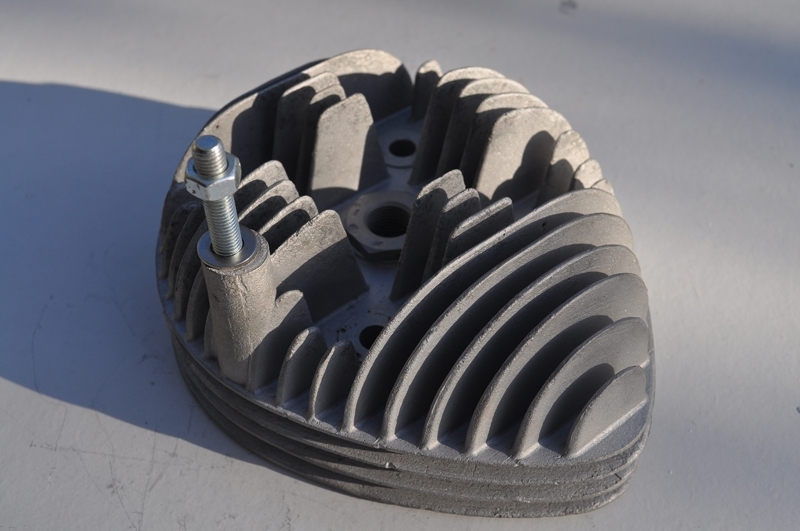 The Crankcase halves received similar treatment as the head and barrel. Using electrolysis to relieve some rust between the cases and the crankshaft bearings making for less of a chance of cracking the cases when we came to drive the bearings out. The reason why we tried so hard to salvage the engine was because of it's matching numbers to the frame, 100% correct engine mounts for the frame also, let alone the impossible task of finding a direct "Tri-peugeot" engine replacement. This being said - it was unusual to be able to find "Most" brand new replacement parts (e.g. Piston etc.) for the rebuild to be possible. All bearings within the box were also replaced as usual with a full engine strip. The crankshaft had seen better days, we outsourced the crankshaft to get rebuilt by Scholar Engineering, converting our old needle bearing to a journal roller bearing. Being such a unique bike, this Triporteur has an extended crankshaft to cater for the turbine on one side. Otherwise, it would be identical to one found on a Peugeot P55. One of the only parts to be outsourced as we don't have the specialist equipment to press the crank pin . 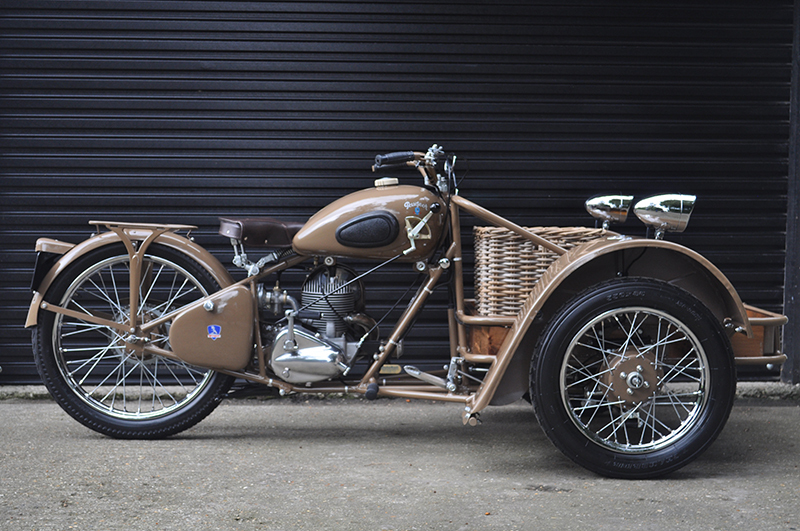 All the necessary procedures to certain parts such as the Carburettor, Tank, Frame and wiring have all taking the top notch restoration processes, techniques perfected over the last 3 years of motorcycle restoration to offer this Peugeot the best standard of finish. The intricate frame was hand prepped for paint using various wire brushes and sanding grades. Hard to reach areas were blasted with grit, especially welds and crevices were rust may lie. The frame was then treated with market leading rust prevention – FERTAN. Before being primed and painted. One of the joys of motorcycle restoration is the challenge of making the motorcycle as original as possible. Usually making sufficient research and the history behind the bike. We actually approached contacts in France for multiple challenges but that’s all part of the challenge in building a bike of this age. A 1950’s motorcycle, with the standards of paint not to what you would expect in today’s auto world – not just the level of finish, but the way they would change shading. Even up to the 60’s where BSA were painted in the dark on night shifts. Were shades of Flamboyant Blue for example were mixed through different shifts. This makes it hard to find the correct paint codes. Our contacts from Melun, France kindly offered and translated documentation from a French Transportation enclyopedia which contained such information to attain the correct paint codes. As seen from the “Before” photos there was no paint to be found – except from the underside of the rear rim where we found what looked to be the original paint, which we used alongside the paint codes to produce the nearest match we could. Being the rare TRI-Peugeot that this bike is. We can understand the lack of new parts available from suppliers. However, understanding the range of Peugeot’s bikes and their similarities between them all allowed us to find similar needed parts to be modified to fit our Triporteur. However, certain components had to be created from scratch. 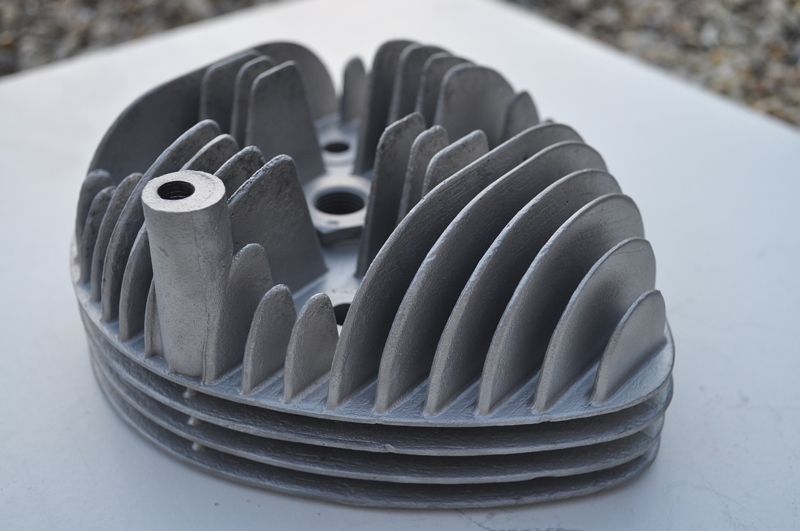 Items such as a cooling fan/Turbine that are simple un-obtainable – we were able to re-create out of sheet steel. The steering to the front two wheels are connected by track rods connected to spring-loaded ball joints which have all been acid cleaned, glass blasted and zinc plated for a pristine finish. All balls greased sufficiently and rubber sealed to minimise water ingress. Track rods and linkages have been zinc plated also and coated in a hard wearing satin black finish. Original Shallow Castle nuts and clevis pins were sourced to secure linkages just as they would have originally would have been back in 1953. It sure is quite strange building three wheels for this restoration. Hubs were stripped off the old spokes, bearing measured and sourced before being dipped in ammonium chloride + Electrolysis for a total of 2 weeks until they were spotless to ease the work needed in the blast cabinet. Etch primed and finished with the original paint. Bearings pulled in cold and the wheels are built and trued on new rims and spokes. Tubes and tyres mounted and ready to bolt. Finding out later on in the build we found that it is an early 1953 model which offers the lower weight capabilities of the later ’53 model. The earlier of the two had a weight limit of 120KG inside the crate with its 100cc Single pot, expanding later on to the heavier weight capabilities of 150KG with its 125cc Single pot. Because of this research we found out that our bike was 100cc. With the Crank finally back from the engineering shop, with a new crank pin we could build the engine. With its simple 1 shaft to 3 gears the box seemed very empty comparing to the Japanese bikes you see today. Like every rebuild we do in house, all bearings were measured carefully before separation for bearings to be ordered and replaced upon re-assembly. Fly wheel and points fully refurbished, the wiring loom which contains around three wires loomed with period looking loom material to really accentuate the age of this machine. 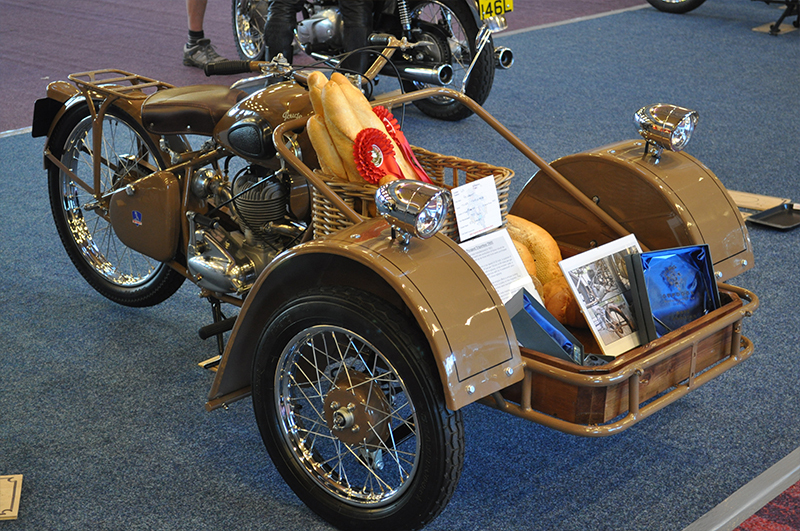 This Triporteur attended the 25th annual Copdock Motorcycle show. We were delighted to have received "Class Winner" and "Best Foreign" awards with rosettes given, fantastic comments from judges and the public. Peugeot's advertisements at the time boast a top speed of 28 mph, a payload of 150 kg whilst consuming 3L of fuel per 100 km or 94 miles per gallon. Peugeot sold 28000 model TN55’s until it ceased production in 1957, at a cost of 165 French Francs, £127 in 1953 and equating to £2900 today. The TN55 was available with 4 options, a low wooden case, a full height open box or a full height box with lid. A waterproof canopy was also available, as were 5 colour options. Each of the suspension components have been glass blasted to remove rust and then been zinc plated in-house, to produce a corrosion resistant finish. Researching the paint colours allowed us to re-finish the tin-work and tank in the original colour, beige-dame which was mixed in original air dried acrylic finish for that authentic look. Thought to be one of three Britain! This is the time for you to get your hands on some French heritage of which you know and trust is brought up to an excellent standard of finish. This bike currently has NOVA declaration and dating certificate from the VMCC. Registration can be taken care of if sold to a UK buyer. Full Valet, 70 point Check. £12,495.00 – Viewing always advised / Part Exchange Considered.